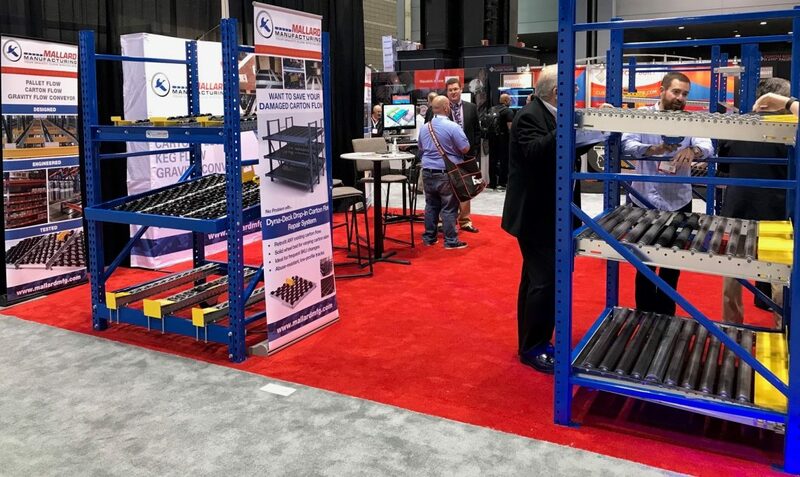 It’s ProMat 2019 and the gang is all here… but more importantly the gravity flow solution you need is here! At Booth S449 to be exact. How can we say that? It’s easy to be confident when you know your pallet flow, carton flow and specialty flow rack products are tried, true and proven successful time and time again. Storage solution needs are solved, picking operations are optimized and warehousing inefficiencies you didn’t even know you had are reinvigorated and made more productive. When you come by the booth you will be able to touch and feel the products and watch them work. You can see video footage, speak with a knowledgeable industry professional and even go over plans if you’ve got them. Talk about optimized efficiency… spending some time at the Mallard booth will save you time in your search for just the right warehousing solution to meet your needs. 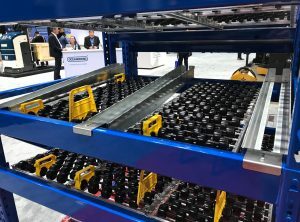 Full roller with new drum roller speed controllers – come and see how these rollers operate more safely and efficiently for plastic pallets and other particular applications. Heavy-duty Magnum Wheel with indirect mount speed controllers – the industry’s toughest rollers… guaranteed. Steel skate wheel flow rails – economical solution doesn’t mean inferior. Come and see what sets our skate wheel rails apart. New Cart-Trak with bearings – a new option of our popular carton flow solution can save on number of rollers and pitch. Dyna-Deck replacement carton flow – cost-effective replacement carton flow that easily drops into existing shelving for heavy-duty, low-profile applications. Bottle Pick Rack – sturdy, single-bottle troughs consolidate slower movers into a condensed, organized and easy to pick location. Pallet Separators – hold rear pallets back from the front pallet to relieve dangerous back pressure and improve overall efficiency. With a complete line of pallet separators, we meet your inventory needs. Carton Flow Accessories – Lane dividers, guides, ramp stops and ergonomic tilt trays. Extend-a-Rail – Mobile, expandable pallet flow for truck-offloading, staging, wave-picking and more. There is so much to see! So be sure to come by and let’s talk future plans and projects. We’ll get right to work helping you meet your future project goals!